My wife and I just celebrated our second wedding anniversary (11 years together in total if you can believe that!) and per our tradition, we decided to spend it in some exotic locations halfway around the world. For our honeymoon two years ago, we spent 8 nights in Moorea/Bora Bora and last year for our first anniversary, we went to Bali and Phuket. While it is getting decidedly tougher to keep topping our previous honeymoon/anniversary trips, this trip was probably our favorite yet. Here is how I booked this amazing trip to Dubai and the Maldives using points & miles. 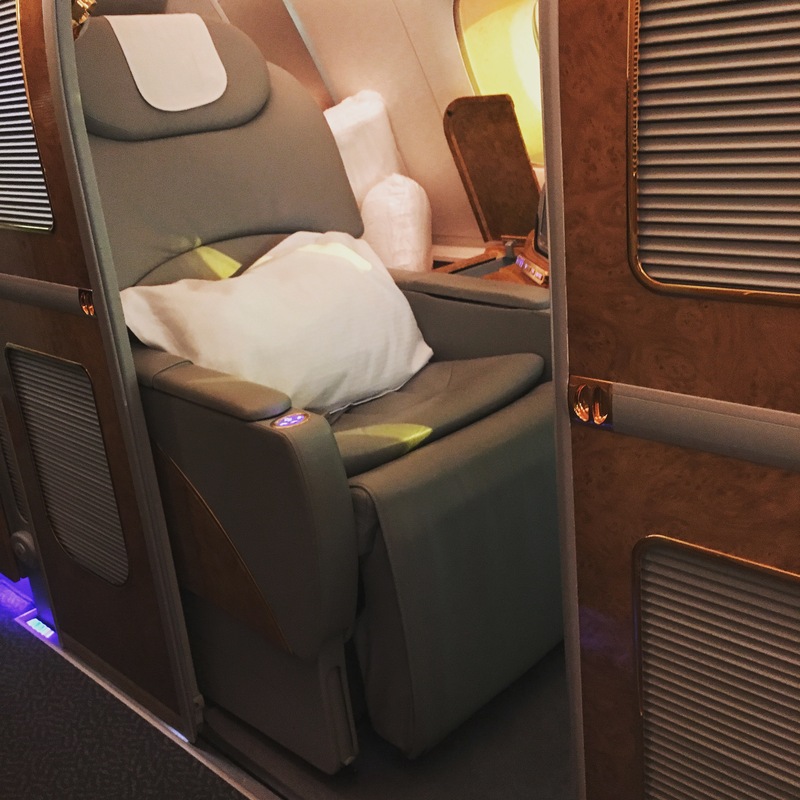 For this special trip, I knew I wanted to fly either business or first class and in particular there was one product I really wanted to try – Emirates First Class. The most feasible way to book this is with Alaskan Airlines miles and one huge perk of the Alaska program is a free stopover, even on one-way awards. As such, since I wanted to stop in Dubai on my way to the Maldives, it made the most sense to book an award from JFK to Dubai (stopover for 2 nights) then onward to the Maldives. The cost for this award is 90,000 Alaska miles per person one-way and as stated, whether I flew NY to Maldives or NY-Dubai (stopover)-Maldives the cost is the same. The flight from JFK to Dubai was on the flagship A380 which has showers for first class passengers. The flight from Dubai to Male was supposed to be operated a Boeing 777 with older first class seats (no suite) but 3 days before the flight, the equipment was changed to a 777-300ER which meant a first class suite for the short 4 hour flight! Can’t beat this for a 4 hour flight! To get these miles, I’ve been churning Bank of America Alaska Airline cards for a while now and to supplement the remaining amount needed, I transferred some SPG points to Alaska. I couldn’t book this award online with the stopover but calling Alaska Airlines was a piece of cake and this award was booked in no time over the phone. 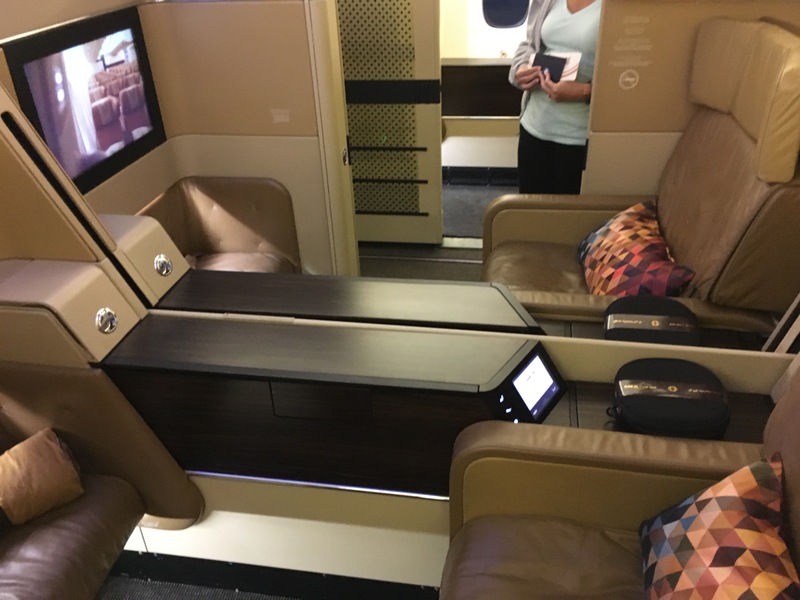 I didn’t have anymore Alaska miles (otherwise I would have tried to route home on Emirates First Class again) so I turned to another Middle Eastern carrier and booked a first class award on Etihad. The final routing was simply Male-Abu Dhabi-JFK. 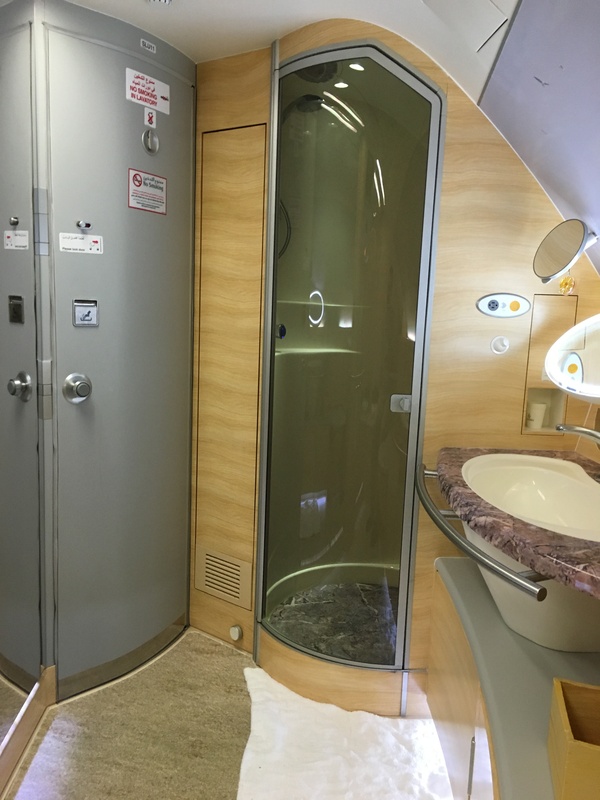 While not as flashy as Emirates, Etihad offers a very solid first class product with a enclosed suite but alas no showers #firstworldproblems. The two center seats in the photo above were our seats for the 14 hour flight from Abu Dhabi to JFK but for the Male to Abu Dhabi leg, Etihad only flies an narrow body Airbus A320 which was kind of a disappointment compared to all the other flights on this trip (Maldivian flights notwithstanding) but it was perfectly fine for the 4 hour flight. The best way to book Etihad flights is with American Airlines miles and to book this first class flight home the cost was 90,000 miles one way per person. Unfortunately with AA’s announced devaluation, this award will increase to a staggering 115,000 miles one way which will be the second most expensive award on the AA award chart (the highest will be first class to Africa for 120,000 miles one way). We stayed a total of 2 nights in Dubai but it was really just one full day as we landed around 8pm on a Friday night and our flight to the Maldives left early Sunday morning. 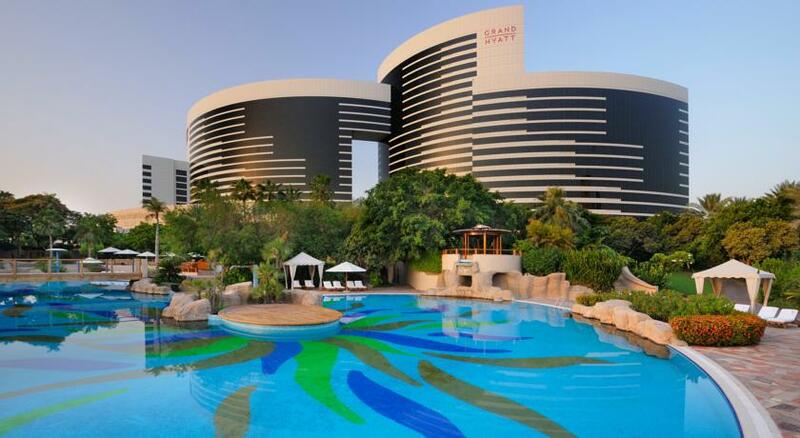 My goal for Dubai was to use some expiring free night certificates from the Hyatt credit card, which allows you to book a category 1 -4 hotel for free. 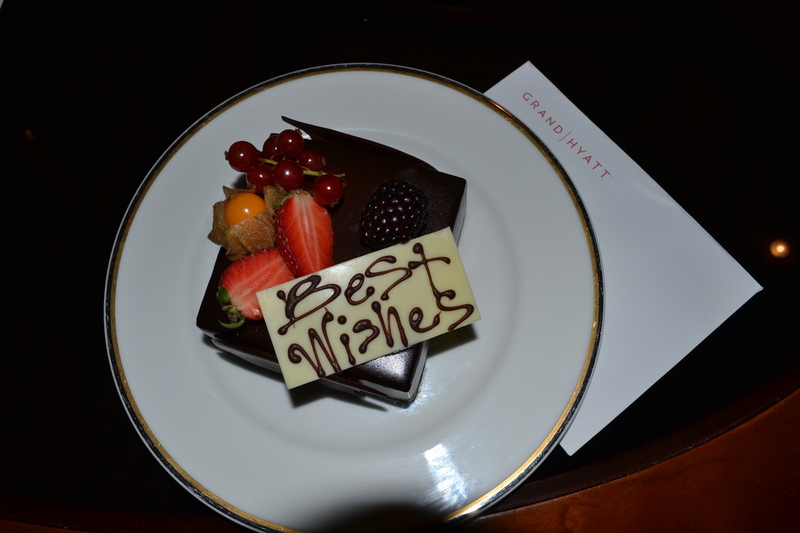 In Dubai, there are several Hyatt hotels in categories 1-4 so we chose the nicest which in my opinion which was the Grand Hyatt Dubai. As you probably know, you only get 1 free night certificate per year for renewing the Hyatt credit card but I shared a trick/tip on how to extend the expiration date of a Hyatt free night certificate here. By extending it, I was able to use last year’s certificate which was due to expire in September 2015 PLUS this year’s free night certificate to cover my two nights. Rooms generally go for $200-$300 a night but we actually got upgraded to a deluxe room so the $75 annual fee for renewing the Hyatt card was well worth it! 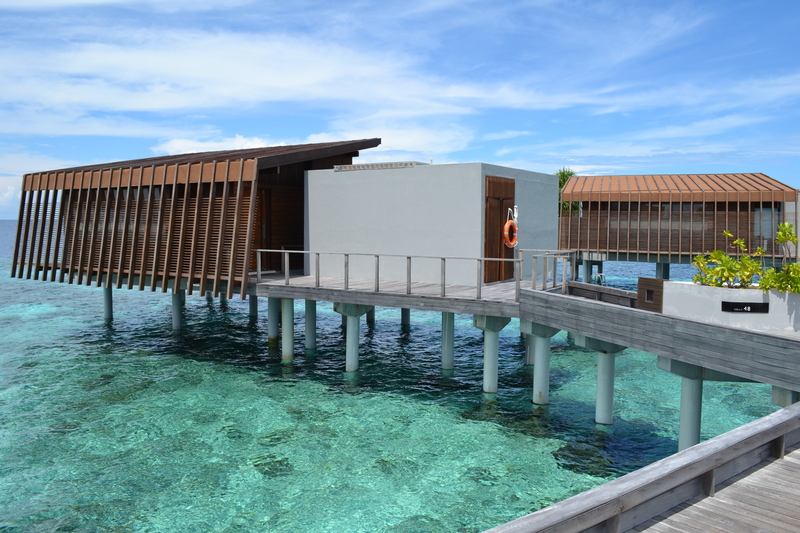 I would argue there are only two realistic hotels to use points at in the Maldives – The Conrad and the Park Hyatt. Yes there are others but they are either insanely expensive with points (W, St Regis) or get awful reviews (Holiday Inn, Sheraton). 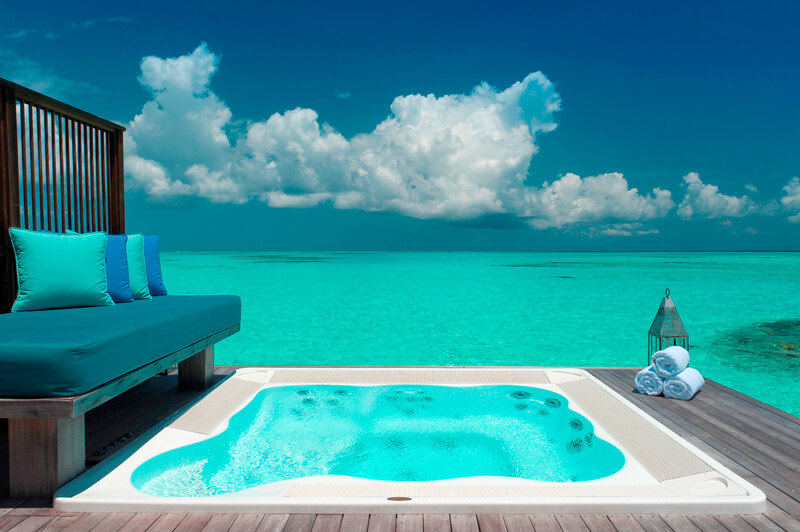 The Conrad Maldives cost points 95,000 points a night while the Park Hyatt Maldives is 25,000 points per night. Based on our point balances, the easy call was to go for the Park Hyatt Maldives. About 10 months before the trip, I had my wife apply for the Hyatt credit card which gives you 2 free nights at any Hyatt in the world. Arguably, this is one of the best redemption for these free nights as nights generally go for over $1,000/night here. Those free night certificates covered the first 2 nights while the remaining 4 nights (we stayed 6 nights total) I used my Hyatt points which I transferred in from Chase Ultimate Rewards. It is important to note that these free nights only book into the land villas which are still fantastic, huge villas that offer a direct path to the beach. 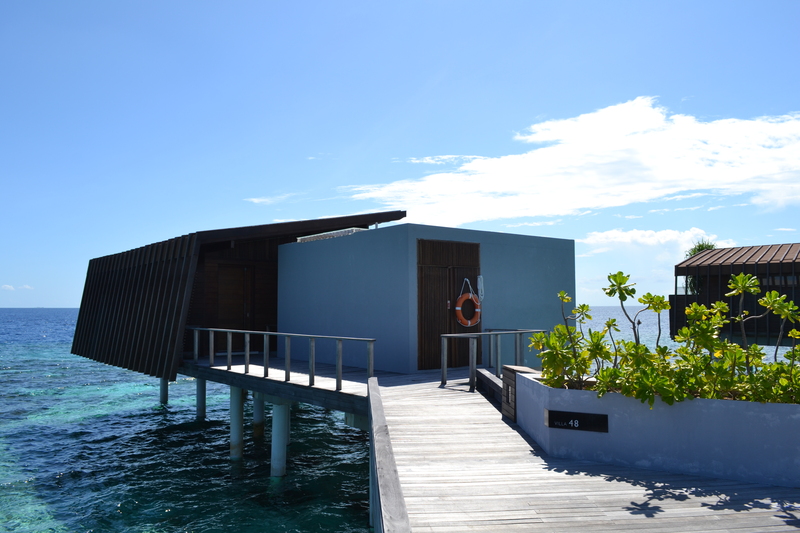 However, we traveled all this way and I could not resist upgrading to an overwater villa for a few nights. This paid upgrade cost $400/night but was totally worth it. We also tried out a land villa with a private pool which I will discuss more in the trip report to follow over the next few weeks. 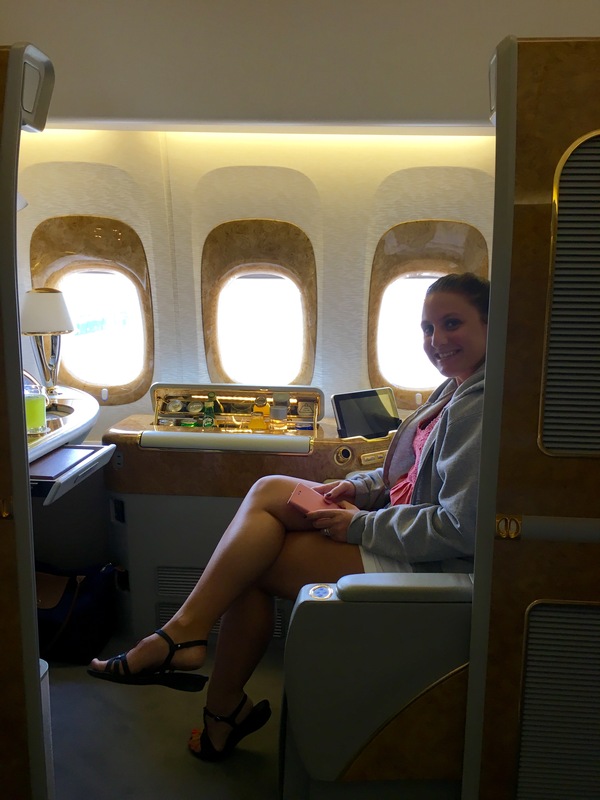 In short, this was probably our favorite trip we’ve ever taken as we got expierence a true first class experience on Emirates and Etihad and the natural beatuy of the Maldives. The stopover in Dubai was great for 2 nights to break up the trip and I think it is worth seeing Dubai but not for more than 2 nights. We used a total of 180,000 Alaska miles, 180,000 AA miles, 2 Hyatt Free Night Certificates, 2 Hyatt Anniversary Free Night Certificates and 100,000 Hyatt points. To think this trip would easily cost over $30,000 and we did it for almost nothing with points and miles is simply amazing to me, even after all these years. Full trip report to follow with tons of pictures! Earlier I published how to fly to the Maldives using frequent flyer miles from several different programs, including the miles I used for a $17,000!!! ticket to the Maldives flying Etihad in Business and First class. This post will go over some of the hotel options you have in the Maldives, the hotel points you need for free nights and how we booked our hotel, the Park Hyatt Maldives. Even though it is a distant, hard to get to tropical destination, there are several hotels you can use points at from the major hotel chains. Some of these options are much better than others with the Park Hyatt Maldives being the best option in my opinion. At a cost of 30,000 Hyatt points a night (25,000 points a night if you booked it before 1/22), this hotel seems to be the most affordable from a points perspective. The Park Hyatt is a true 5 star luxury hotel that encompasses its own private island – that’s right there is literally nothing else on the island except the hotel. See the photo below. The Park Hyatt Maldives appears to me, at least based on the research I’ve done, one of the most luxurious properties in the Maldives you can use points at along with the W Maldives. So if your goal is true luxury, I recommend the Park Hyatt Maldives. Hyatt points are quite easy to obtain thanks to being a transfer partner of Chase Ultimate Rewards so any points earned from the Chase Sapphire or Chase Ink cards (hello 5x at office supply stores), can be transferred to Hyatt. This would also be an excellent place to use the two free nights you get for signing up for the Chase Hyatt Visa credit card. With room rates always over $1,000 (sometimes closer to $1,200) and this being a top tier Category 7 Hyatt hotel (there are only 6 others hotels in this category) this in fact might be the single best hotel in the Hyatt system to use your free night at. Free nights either via the credit card or points book into beach villas and you can upgrade to pool villas or over the water villas for $300-$450 a night. Another option though significantly more expensive now after the big Hilton devaluation is the Conrad Rangali Island Resort. As a top tier category 10, this hotel costs 95,000 points a night! While it’s true that Hilton HHonors points are worth a lot less than Hyatt points and HHonors points can be acquired more easily and quickly, that is still a ton of points. If you have any form of Hilton elite status (and you definitely should if A) you are planning on staying here to get free breakfast and B) how easy it is to get status from one of their credit cards), you can get the 5th night free on award redemptions, dropping the cost to 76,000 points a night on a 5 night stay. Free nights book into a beach villa and you can upgrade for similar amounts like the Park Hyatt. Cash rates can fluctuate between $550-$800 a night. The Starwood options include the Sheraton Full Moon and W Maldives but neither is a great option on points. The Sheraton Full Moon is a category 6 hotel that costs 20k to 25k SPG points a night. While I obviously haven’t stayed there, the reviews aren’t too great on this hotel and it costs a ton of SPG points for this level of hotel. The W Maldives, which by all accounts seems like a fantastic hotel, is a limited participant Starwood hotel, which means its costs a boatload of SPG points (upwards of 90k points a NIGHT!). With SPG points so hard to acquire, I don’t think either hotel is a viable option and other hotels in this post offer better value. 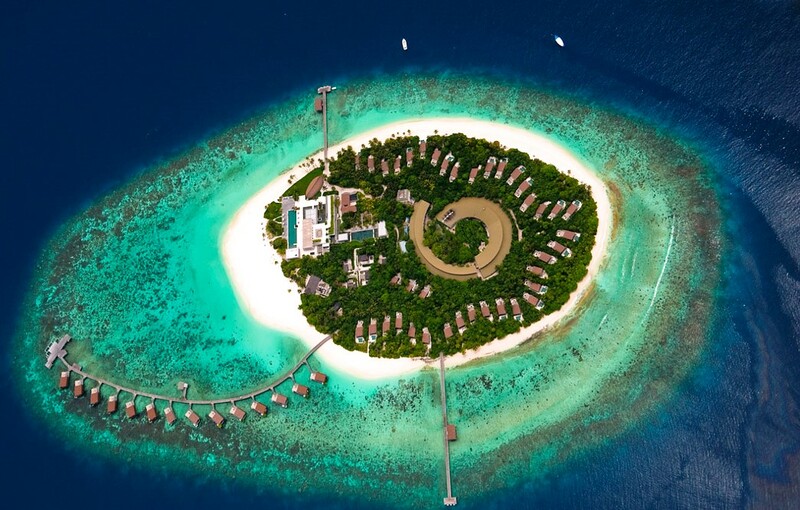 The IHG option in the Maldives is the Holiday Inn Resort Kandooma Maldives. This is definitely a lower tier hotel compared to others in this post but costs only 35,000 IHG points a night. Paid rates seem to range from $250-$300 for base level rooms. While not for me, this could be an attractive option for some looking to save money or save more valuable Hyatt or SPG points. There are no Marriott nor Ritz Carlton hotels in the Maldives so you cannot use Marriott or Ritz Carlton points here. There were rumors of a Marriott property opening in 2015 but I can’t find anything on this. Supposedly in July 2015, there will be an option to use Club Carlson points at the Radisson Blu Maldives Hulhumale but the projected opening date of the hotel has been pushed back many times already so I wouldn’t plan on this option until it actually opens (if ever). As mentioned previously, we decided to book the Park Hyatt Maldives for our 2nd anniversary trip since I had abundance of Hyatt points and two free nights from Andrea’s application for the Hyatt credit card. While we don’t need luxury on every trip we take (we’re quite content to stay in 3 star hotels), this is a special trip so I splurged points-wise for both the flights and hotel to have a more luxurious trip. If I didn’t have Hyatt points, I would most likely focus on earning Hilton points and getting free nights from the Citi Hilton Reserve credit card to stay at the Conrad. Enter your email address below in the gray box to follow PointsCentric and receive notifications of new posts by email. Make sure to check your email to confirm your email address! Subscribe to Blog Posts via RSS!